Better job posts attract better people! Writing a perfect job post to attract the candidate is the pre-requisite when you decide to hire. Designing and framing the job advert could be quite a task even for the gifted writers. What to include, where to start and how to make it interesting is what you need to think about while writing the perfect job post. Your job post that is to be posted on the free job posting sites should carry a job title. The job title is the fundamental element of your job posting. When you write your job title include the name of the position, make sure it reflects the nature of the job and the duties associated with it. Read on to know more about the perfect job postings. 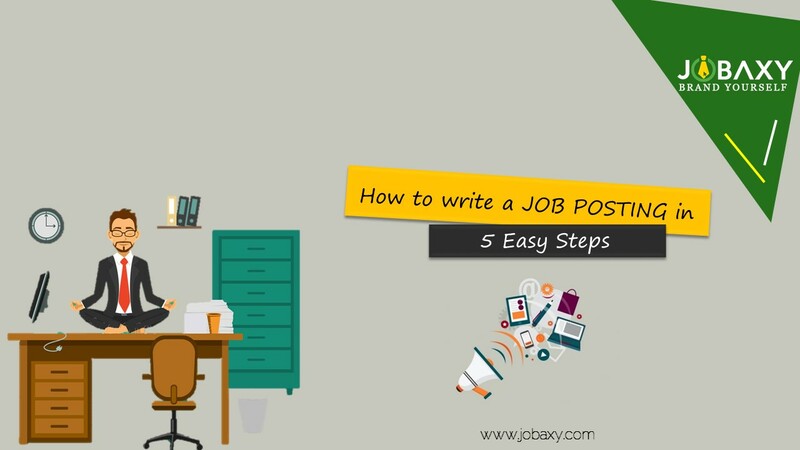 This guide will ensure that you cover all the important points while posting a job. Branding of the company is frequently done to attract the clients. The similar rule should be followed to attract the candidates. For creating your brand, you must highlight the distinguishing factors of your company, mentioning any awards or noteworthy recognition. Then mention how you value your employees and their work. The description should be concise but effective, preferably a paragraph which, is included either at the beginning or the end of your job post. Now, this part is the heart of your job post. Here you need to mention briefly about the need and demand of the role. Just a bulleted list of the responsibilities will not give the candidate the essence of the job. To get the candidate the feel of the role and make him consider it, you need to go beyond the bullet points. Write a brief narrative that resonates with the candidate. Provide details about the interesting aspects of the job, the customers they’ll be dealing with, and the impact of the role on your business. Develop a connection with your audience so that they are interested enough to apply for the job. If the candidate is attracted to the role, he will read in details what exactly the job profile will be. As mentioned above, only bullet points will not suffice as you do not want to scare the candidates by the laundry list of expectations. But at the same, you also do not want to miss on your core expectations. While writing this, think of your basic expectations. Try and condense the duties. Mention those that are really important as the not so important ones can be discussed while interacting with the candidate. Your wording should be simple, to the point and clear so that the candidates understand it easily. If your narrative is too long you can keep a few bullet points, limiting those up to a maximum of 10 points. Here you mention the absolute must-haves. Your job post should include the degree, experience, any technical skills and specific soft skills that are required for the job. Any other additional qualification or skills that can be valuable should be mentioned in the category of ‘nice-to-have and not ‘must-have’. By doing this you don’t lose on the deserving candidate. To make your job post-user-friendly add in it the call to action button for the candidates to apply directly for the role. The process should be simple, the more simple and direct it is the more applications you’ll receive. This facility should be available for both desktop and mobile applications. Some candidates may want to research more before applying so for them include links to your site or videos or social media news. This gives a bigger picture of your company and is appreciated by the candidates. To conclude, put your best foot forward while writing your job posts. Any help you require for writing or posting free job postings in the Philippines, please contact us at jobaxy.com. Jobaxy is the best online job portal in the Philippines.